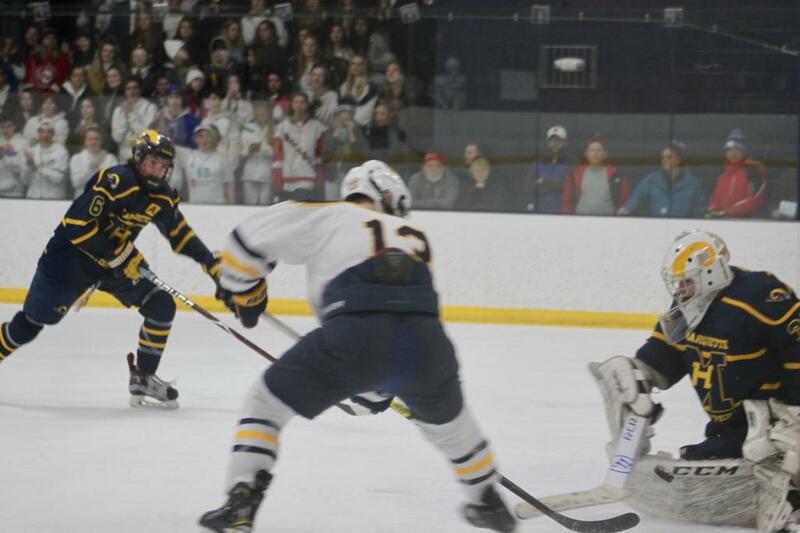 The stands were filled at University School and the cheers moved back and forth as the crowd watched the Classic Eight Conference boys’ hockey game between USM and Marquette on Tuesday, February 5th at USM. On the ice the play moved back and forth, but most of the moving of the puck was done by the Wildcats as they skated to a 9-0 victory over their long-time Milwaukee area rival. “Total team effort.” said Jason Woods, USM’s head coach. The Wildcats scored 9 goals and all but one was due to at least one assist. The players on the USM team were willing to pass to move the team onward to victory. As they often do, the Wildcats scored early. 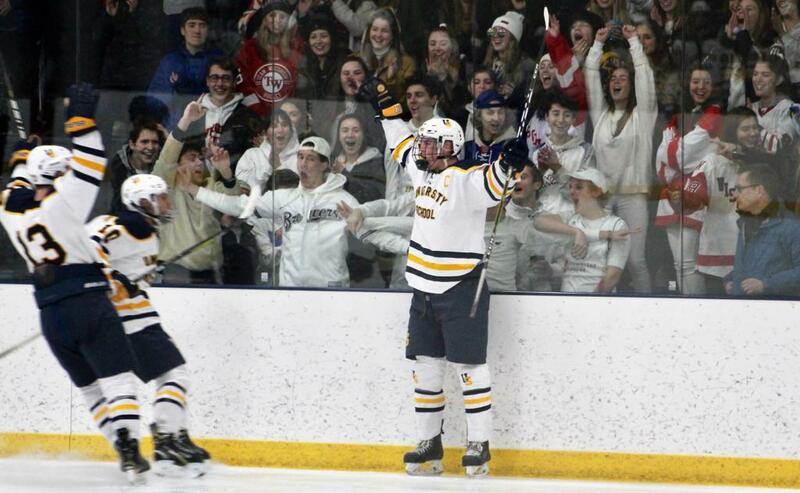 They scored 5 goals in the first period, with the game winner coming just 30 seconds into the game when Tyler Herzberg one-timed a pass to the slot from Robby Newton, who himself was the recipient of a pass by Ethan Mann. Herzberg scored USM’s second goal at 6:32 off of assists by Mann and Casey Roepke. USM scored three goals in just over a minute near the end of the period. 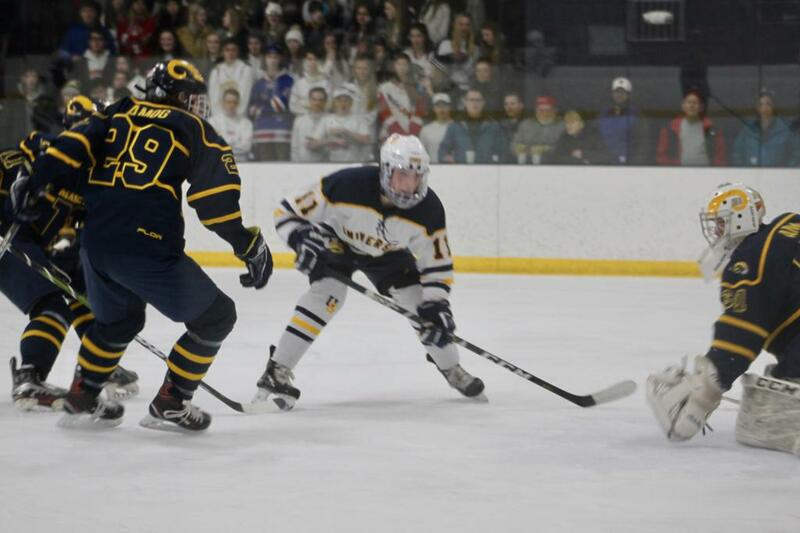 Sterling Cooke swiped a shot past Hilltopper goalie Nick Ahlers at 13:27 off a pass out front by Carson Mogush. 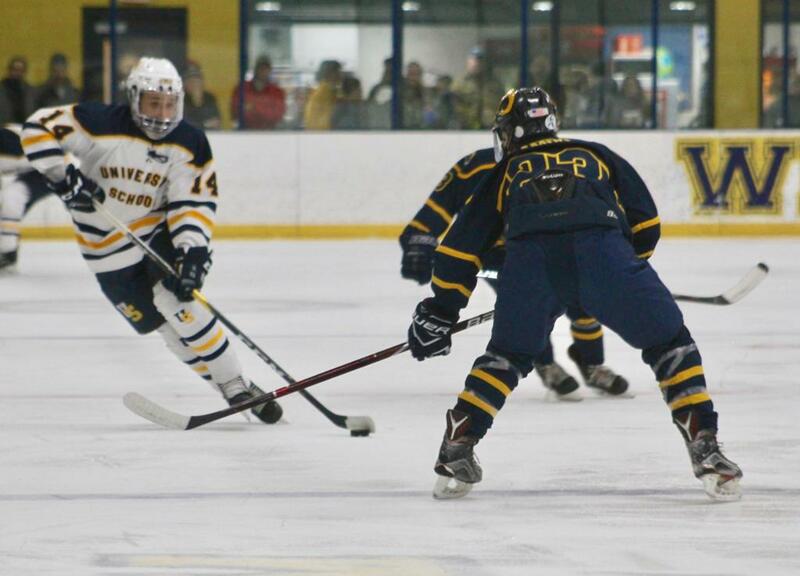 At 14:06 Ethan Ford moved the puck to Herzberg, who in turn, moved it to Mann who wired a quick shot past Ahlers. 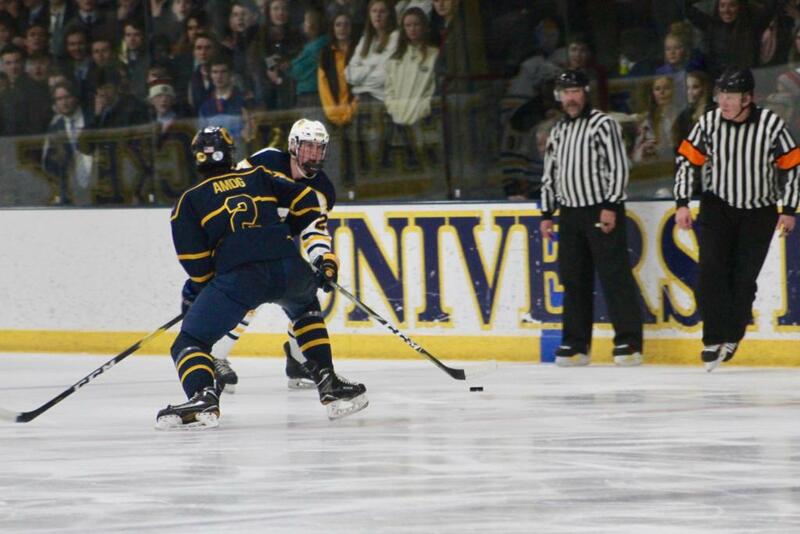 Then at 14:56, Mogush moved the puck to TJ Fenton who snapped it past Ahlers, giving USM a commanding 5-0 lead. 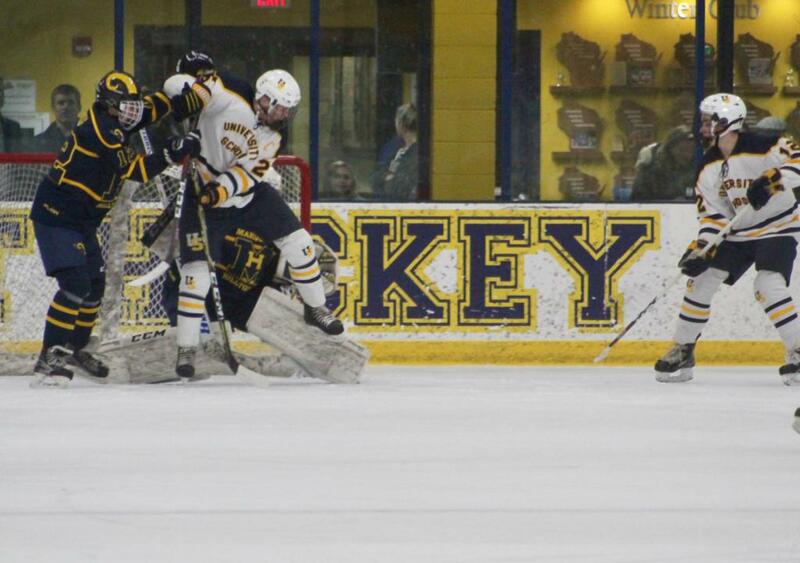 The Wildcats received a penalty late in the first period, so Marquette opened the period with a power play. That didn’t faze the home team. USM put the clock on running time just 13 seconds into second period. 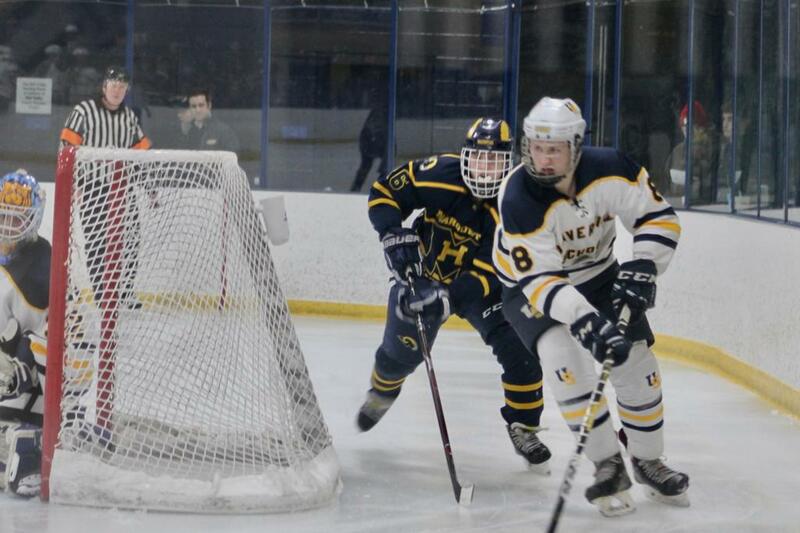 From the faceoff they quickly moved the puck into the Hilltoppers’ end where Herzberg and Mann combined for Mann’s second goal of the game to make the score 6-0. USM received two more penalties early in the second period; therefore, the Wildcats were playing with a deficit of two skaters. Desperate for a goal, Marquette pulled Ahlers for a sixth skater, to have a three-skater advantage. The move was risky. It backfired. Blake Carey intercepted a pass near the USM blue line, skated to the center red line, then lined a shot into the empty net at 3:25 for another shorthanded goal, USM’s only unassisted goal of the night. 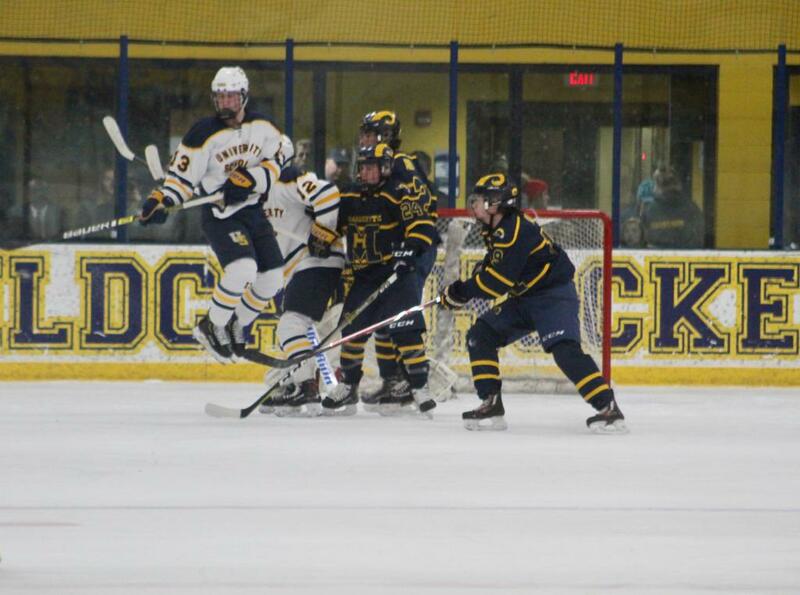 The Wildcats scored their eighth goal on their own power play opportunity. Mann gained his hat trick and Herzberg and Carey had assists on the play at 11:12 of the second period. The clock was running, but the USM contingent still had time for one more goal. Reid Woods scored it and once again Carey and Herzberg were awarded assists. As Ford indicated, Kelly earned the shutout by stopping all 19 shots the Hilltoppers took. Ahlers gave up 8 goals but stopped 31 other USM shots. 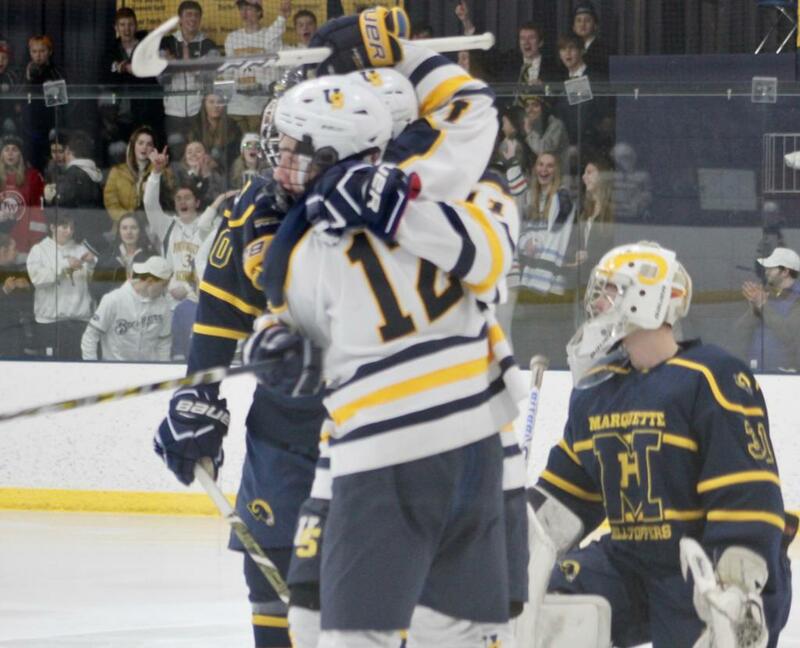 The loss dropped Marquette's record to 13-8-1 and 4-2-1 in the Classic Eight Conference. 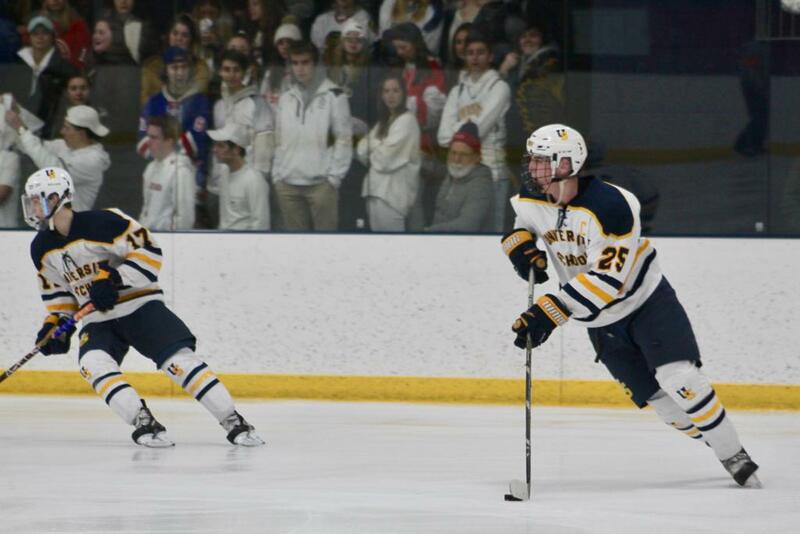 The Hilltoppers take on Fond du Lac in a non-conference game at 7:00 p.m. on Thursday, February 7th at Eble Park Ice Arena in Brookfield. USM is now 20-2 and finished at 7-0 in the Classic Eight Conference. 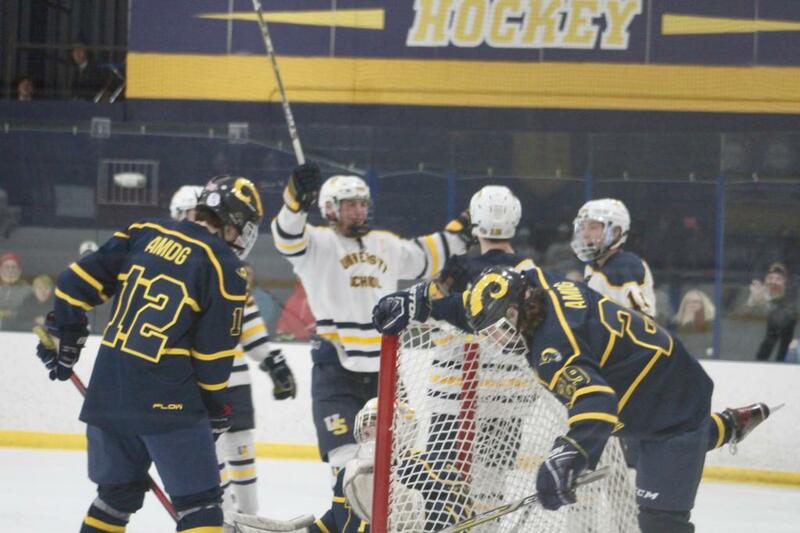 The Wildcats play Onalaska in a non-conference game at 7:30 p.m. on Friday, February 8th at USM.